But, like, how cursed is it, really? As anyone in theatre world probably knows, Macbeth isn’t supposed to be mentioned inside a theatre, which is why it’s often called “The Scottish Play” or other nicknames (here at Shakespearemachine we usually prefer “Mackers”). If you say the name in the theatre, you have to leave the building, spin around three times, spit over your left shoulder, and either cursing or say a line from a different Shakespeare play before knocking to get back in. Otherwise, bad luck will befall either the speaker and the theatre in general. We tend to believe in the superstition; during our director’s pre-show speech before Faustus back in January, when he announced this fall’s performance of Macbeth, those of us in the cast collectively shuddered backstage every night. And we have indeed had our share of bad luck, which seems to indicate that we should take a “better-safe-than-sorry” standpoint and avoid the name just in case. The riot outside Astor Place Hotel; depiction from the Library of Congress. So not a great track record, overall. 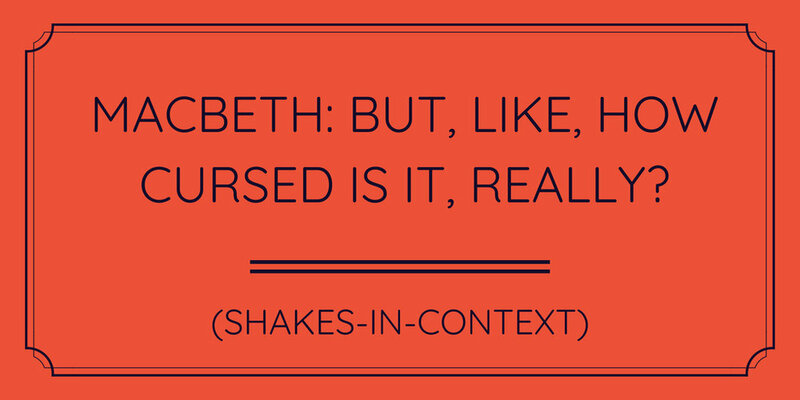 The History Channel relays the rumor that the whole “curse” thing all started when the play was first performed in 1606 and the actor meant to play Lady Macbeth suddenly died, forcing Shakespeare to play the part himself. Some people believe that because Shakespeare incorporated real spells into the Weird Sisters’ dialogue and real ingredients into their potions, he brought the curse upon the play himself, whether intentionally or unintentionally. Some people believe that witches “cursed the play for eternity” in revenge for portraying them so wickedly, according to the Telegraph. Belief in witchcraft WAS big back then, after all (to find out more, keep your eye out for our spooky Halloween post in a few months). Plenty of reports of these incidents had the chance to bring up the “curse,” and yet none of them did. This points to the conclusion that Macbeth wasn’t a specifically unlucky play; it was just a play that was performed a lot because of its popularity, so it would naturally end up having more tragic incidents occur in conjunction with it. Paul Menzer goes into much greater detail about the supposed origins of the curse and all of its fun anecdotes, so check out his book here if you want to learn more. Spooky superstitions, and daggers, and witches, oh my. Pictured: the witches from Kenneth Branagh's 2013 production of Macbeth, screened by the National Theatre Live. No reality behind the superstition, then; just tradition. But who can blame people for concocting this mysterious curse? After all, Macbeth is a spooky play, full of witchcraft and ghosts and mystically-appearing daggers. The fact that this superstition (probably) isn’t real doesn’t ruin the fun. Do you believe in the curse? Tweet us @shakesmachineFW let us know. Special shoutout to the Hurly Burly Shakespeare Show, a fabulous podcast hosted by Aubrey Whitlock and Jess Hamlet, for introducing us to Paul Menzer’s book and their fantastic discussion of the curse in general. Check out their episode on Macbeth here. And look forward to September, when we start getting into Macbeth rehearsals! We can't wait to start posting interviews with the cast and behind-the-scenes fun. Thanks for reading!